As conversations in Colorado continue to swirl around sustainably funding the governmental public health system, national-level challenges that severely undermine investments in prevention and public health programs have emerged. U.S. House Leaders announced on October 26th that legislation extending funding for Community Health Centers, the National Health Service Corps, and the Children’s Health Insurance Program will come to the House floor this week for a vote. The legislation is expected to closely mirror two bills that passed the House Energy and Commerce Committee at the beginning of the month – the CHAMPION Act and the HEALTHY KIDS Act. The CHAMPION Act uses the Prevention and Public Health Fund (PPHF) to shore up some of the above programs. It is expected that these bills will be rolled into one piece of legislation that will be voted on by the full House. While these programs are all essential components to the public health and health care system, funding them at the expense of public health infrastructure and programming would have catastrophic long-term consequences to the health and safety of the people of the United States. The CHAMPION Act alone could cut the PPHF by $10.5 billion. Rather than diverting funds from the Prevention and Public Health Fund, a responsible and more equitable solution would extend funding for the programs that expired on September 30 without raiding local, state, tribal, and federal funds that support efforts to improve the health of people in every state. Learn more about these efforts in a statement from Public Health Institute opposing the CHAMPION Act and an APHA letter to the House Energy and Commerce Committee. October has been a great month; hitting the road and meeting many of our LPHA Directors, Nursing Directors, Regional Epi’s and others. In addition to putting faces with names and re-establishing past acquaintances, I’ve had time to learn more about what is happening with the folks I visited, as I listened to needs and concerns, shared resources, and brainstormed. I would like to thank everyone who’s hosted visits so far, and look forward to meeting more of you as I continue to get out and about through the end of the year. Interested in participating in a visit that might be scheduled near you? Check out the schedule below and register for your preference here. We hope to continue these visits annually, and I encourage you to host one in your area. In the meantime, please don’t hesitate to reach out to any CALPHO staff member with questions or thoughts. On October 17, 18, and 19, CALPHO staffers Peter Manetta and Shannon Kolman attended the Health Equity Advocacy Cohort’s quarterly convening on the Lowry Campus in Denver. Read Peter’s thoughts on a novel housing for the homeless project on the CALPHO Blog. Human Impact Partners (HIP) has launched a 4-part webinar series that will focus on strategic practices for LPHAs to “pursue a wall-to-wall transformation of how they work internally, with communities, and alongside other government agencies.” This series supplements their recently released Health Equity Guide and is co-sponsored by the Government Alliance on Race and Equity (GARE), the National Collaborative for Health Equity (NCHE), and the NACCHO Health Equity and Social Justice Committee. Register here. In a recent op-ed in the Milbank Quarterly, Blomberg School of Public Health Associate Dean Joshua Sharfstein proposed a novel method of funding local public health. Called a public health bundle, the method ties LPHA prevention efforts directly to a targeted preventable health care outcome, such as unintended pregnancy or an asthma-related hospital visit. For a set time-period and geographic area, health care payers contribute the anticipated cost of treating a specific outcome to an LPHA-established fund. Over that time, payers are reimbursed from that fund for actual treatment. Concurrently, the LPHA spends those available funds on evidence-based interventions proven to reduce medical costs related to that outcome. Any leftover funds are reinvested in further prevention efforts. To reduce risk and involve more stakeholders, the bundle can be supported with social impact bonds. This is a very new idea, so there are no pilot programs or case studies that we can find, but we will certainly be following what appears to be a promising approach. Restaurant inspections are a frequent point of contact between public health and the community. When safety violations or illness occur, these interactions can become contentious. But with the right mix of education and enforcement, public health and restaurant managers/owners can emerge from such situations as food safety partners. This is the preferred approach for Lynnea Rappold, the regional environmental health program manager for the San Luis Valley Public Health Partnership. 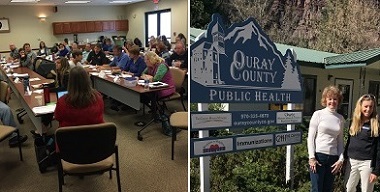 During the quarterly meeting of the Colorado Directors of Environmental Health (CDEH), held last week in Delta, she described a recent case involving a local Mexican restaurant and several customers who reported becoming ill after eating there (including a small child). The culprit turned out to be insufficiently hot and cold buffet trays and she instructed the restaurant to fix the problem. After a few days and some stern warnings, the problem was fixed, and she and her staff made several visits over the following weeks to ensure compliance. They also conducted onsite safety training in English and Spanish. After a few weeks went by, they stopped by to eat lunch. This education and assistance approach demonstrates that her department shares goals with the restaurant: to keep its customers safe and to keep the restaurant in business. Other environmental health directors at the quarterly echoed this, one stating that a local restaurateur came to call the health department his “best friend.” This approach also uses a strategic, Public Health 3.0 lens by considering food safety issues together with upstream health determinants like employment. As part of a campaign that seeks to build capacity for community fluoridation, NACCHO is offering funding and technical assistance to local governments. The funds “can only be applied to capital improvements associated with purchasing new equipment to start water fluoridation or replacing aging water fluoridation equipment.” As part of their technical assistance, NACCHO can also help expand collaboration between LPHAs and their governments public water systems. Learn more and apply here. The Emerging Leaders in Public Health program is an 18-month leadership development program for local public health leaders. It is a practice-based initiative that funds cohort members to "develop and implement a transformative concept designed to deliver a new model of public health for their community" while providing leadership coaching and team-based learning opportunities. Learn more here. The role of white privilege in health disparities can be difficult to explain. This one-page infographic frames the issue using three specific systems where being white proffers significant advantage: education, money, and power. It presents three metrics for each of those areas that poignantly demonstrate educational, financial, and power-based racial disparities that persist when adjusted for class and other factors. Their explanations are short and jargon free. This is a great piece to use for passive introductions to the role of white privilege, especially in situations where recipients may be uncomfortable or defensive with the topic. Download it here. The USDA is now offering implementation, planning, and training grants for the FY2018 farm-to-school program. The program seeks to increase K-12 school's access to local foods by funding local partnerships, training, garden development, equipment purchases, and other areas. Awards range between $20,000 and $100,000, and recipients must contribute at least 25% of a projects total cost. Apply and learn more here. CDC seeks to enhance the Nation’s ability to rapidly mobilize and respond to specific public health emergencies, which may include infectious disease outbreaks, pandemics, and other public health emergencies that exceed the capacity of jurisdictional public health resources. They created this Notice of Funding Opportunity (NOFO) to rapidly fund pre-approved applicants to address immediate and time-sensitive needs that are integral to specific public health responses. Learn more and apply here. The Big Cities Health Coalition's Data platform differs from other data clearinghouses by relying almost entirely on data collected by the cities themselves. Data on a range of public health areas are available, from food safety to chronic disease, and users can filter by race and gender. Denver is a participating city, but even if you are in a rural area, this site is an intriguing example of how cross-municipal data sharing can identify shared policy and advocacy priorities. The coalition is holding a webinar about the new platform on November 16, from 11am to noon, that will also "feature new pages that show how some cities are addressing key public health issues with new policies and programs on the ground." Learn more about the platform here. This collection of strategies provides evidence-based approaches to preventing partner violence, child abuse and neglect, suicide, youth violence, and sexual violence. In the words of former director Tom Frieden, CDC hopes this technical package "sharpens and focuses what otherwise might be vague commitments to ‘action’ by committing to implementation of specific interventions known to be effective. It also avoids a scattershot approach of using a large number of interventions, many of which have only a small impact." Access the package here. . This series continues in the spirit of Serial, telling a true mystery yarn interwoven with timely sociological explorations. The story opens with the travails of a quixotic, improbable character named John and his hate-love relationship with his rural Alabama community. His hometown is emblematic of the social and health challenges public health folks would expect to find in the rural south, but the intimate and raw encounters with the people involved in the story up-end those expectations. The emotional nuance, social complexity, and home-town loyalty captured in this gripping series are a jarring reminder of how inadequately we communicate about the health of a community. Our population-level, data-centric profiles, even when bolstered with some storytelling, are laughably simplistic when compared with this engrossing experience. Listen soon! This year’s Annual will focus on climate change and health. If you're not attending in person, you can follow the event online.